the fabric feeding evenly for complete control. Tell the machine exactly where you want the needle and stitches aligned. A quick touch by the Sensor Pen designates stitchwidth, placement and a stopping point on the fabric. 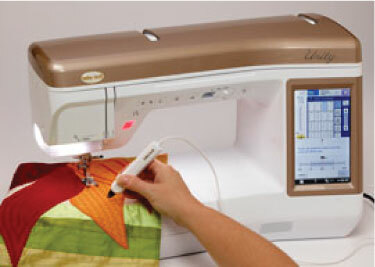 The NeverMiss™ Automatic Needle Thread does exactly what it promises. It’s never been this fast or easy. Clearly see the details of your designs, quickly set the correct stitch, and change your machine settings on the large, color LCD. This screen measures 7” diagonally and displays up to 260,000 colors so you will know what your designs and stitchesreally look like before you sew. Unity knows where to place the design.